After my post about ReactOS I felt I should mention Wine. Wine has similar goals to ReactOS, namely to give users the ability to run Windows applications without buying Windows, but goes about it in a different way. 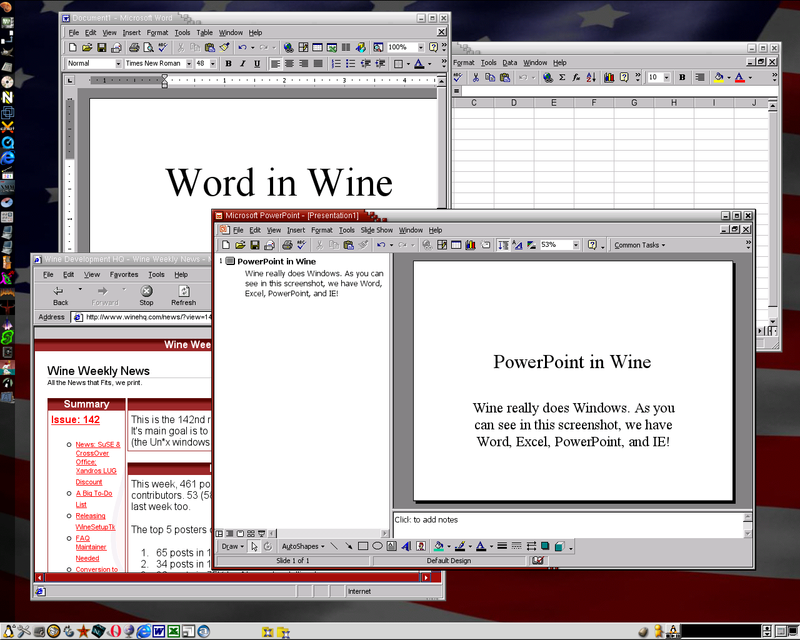 Wine is an implementation of the Windows API designed to run in Linux. This seems like a better approach since a lot of the features of an operating system which have to be implemented by ReactOS already exist in Linux. And of course it can run native Linux apps too. Since it isn’t an emulator, applications theoretically run at the same speed, but the fact that all the library code has been written from scratch this is rarely the case. Contrary to popular belief regarding Microsoft’s ability to write “good code”, much of the stuff underlying Windows is quite well optimised and being so new, some of the stuff in Wine isn’t. Although in a random twist you can apparently get certain random apps to run faster because the Wine team happen to have written that bit of code better. Even so, it’s still a viable alternative in some situations. PS. One of the stranger ideas the have is running Wine under Cygwin (a compact implementation of many Linux APIs) on Windows. I’ve just added WINE to my Linux setup, mainly because I wanted to run a sweet little program called “ir.exe”. This is a program that enables you to upload/download the contents of the eeprom (non-volatile but changeable memory) in certain remote controls, mainly American, but in the UK, the OneForAll 6 (URC-7562). Following the instructions on the site (www.hifi-remote.com) I have created a lead to connect the computer (parallel port) to the remote (6 pins exposed in the Battery compartment) and I have got the program working fully under Linux. The site owner will mail out US OneForAlls to you, they are much more fully-featured than the European model and even with the postage, work out cheaper. I got him to send me a URC-8910 (OneForAll 8, with backlighting, loads of buttons, little LCD screen) which cost $20, plus $9.50 p&#38;p to UK plus $1.50 Paypal surcharge, total $31. Or to put it another way, under £17. This has replaced a £35 OFA6 (though Argos have now dropped the price to £20), which has “double-use” buttons (AV/Exit, Select/Mute) interpretation depending on the previous button pressed … often wrong. Considering wages are higher in the US and all these remotes are made in China anyway, it’s another case of “Rip-Off Britain”.